Mozambique does not regulate and restrict the use of firearms by law enforcement officials as international law requires. Police use of a firearm can only be lawful where necessary to confront an imminent threat of death or serious injury or a grave and proximate threat to life. All citizens shall have the right to life and to physical and moral integrity, and they shall not be subjected to torture or to cruel or inhuman treatment. Article 43 provides that the "constitutional principles in respect of fundamental rights shall be interpreted and integrated in harmony with the Universal Declaration of Human Rights and with the African Charter of Human and Peoples Rights". Article 51 provides that: "All citizens shall have the right to freedom of assembly and demonstration, within the terms of the law." in collaboration with other State institutions, shall be to guarantee law and order, to safeguard the security of persons and property, to keep public peace and to ensure respect for the democratic rule of law and the strict observance of the fundamental rights and freedoms of citizens. In the exercise of its functions, the Police shall owe obedience to the law and shall serve citizens and public and private institutions with impartiality and independence. The Police of the Republic of Mozambique (PRM) was created by Law nº 19/92 of 31 December 1992 as a paramilitary force under the Ministry of the Interior. 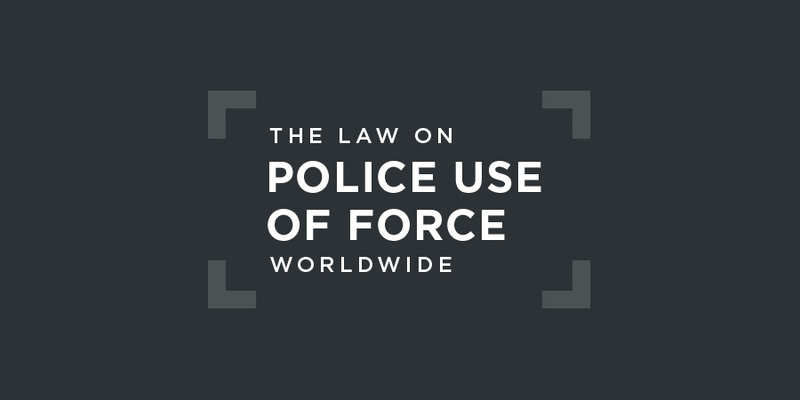 In Mozambique, the rules on police use of force are set out in the 1999 Police Statute and Disciplinary Regulation. Under the Police Statute, the police are required to act with the strictest respect for the Constitution and laws of the country. This includes the human rights provisions contained in the Constitution. may only use force and firearms in situations where there is a reasonably serious risk to the officer’s life or physical integrity, or those of third persons, or in circumstances in which it may be supposed that there is a serious risk to public security, and in conformity with the principles [of opportunity, appropriateness and proportionality]. This is more permissive than international law allows, which restricts police use of firearms to situations where it is necessary to defend people against imminent threat of death or serious injury or to prevent a grave threat to life. Intentional lethal force ("shooting to kill") is only lawful when it is strictly unavoidable in order to protect life. There is no independent civilian police oversight body, but the Constitution provides for the office of Ombudsman "to guarantee the rights of citizens and to uphold legality and justice in the actions of the Public Administration".Art. 256, 2004 Constitution of Mozambique (as amended). at reports of instances of unlawful killings, arbitrary executions of suspected criminals, excessive use of force by law enforcement officers, and the use of torture and ill-treatment in places of deprivation of liberty, including police stations and prisons. It was further concerned "at the lack of concrete and comprehensive information on investigations, prosecutions, convictions and sanctions imposed on those responsible and at the reported impunity of law enforcement officers involved in such human rights violations". that the freedom of assembly and association is not always effectively guaranteed. The Committee is also concerned about allegations of arbitrary arrests and detention of participants in peaceful demonstrations, ... as well as the use of tear gas, water cannons, rubber bullets and batons by police during demonstrations. gravely concerned about allegations of unlawful killings, including extrajudicial executions, by members of the police during the period under review. It is also concerned at allegations that the police resort to excessive and sometimes lethal force, especially when apprehending suspects and controlling demonstrations. Lately, there have been reports of use of excessive force, torture, extrajudicial executions and other human rights violations by law enforcement agents (policemen and prison wardens).